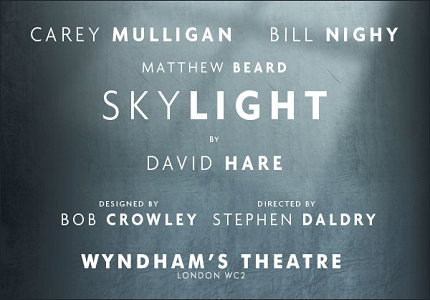 The Oliver Award winning production, Skylight, returns to the West End with a cast of Hollywood stars including Bill Nighy, Carey Mulligan and Matthew Beard. David Hare’s Skylight is a hard hitting tale of love, passion and ideology. Set in London on a particularly cold evening, a young teacher named Kyra receives an unexpected visit from an old flame. Tom, The ever-charismatic restaurant owner, returns to his former lover as a recent widow. As the pair find sparks flying, they begin to rekindle their romance. Whilst passion for one another may once have been enough, the pair now must overcome some serious conflicts of opinion. Hare’s Skylight returns to the Wyndham’s Theatre almost 20 years after winning the 2005 Lawrence Olivier Award for Best New Play. This time around, Hare’s production is handled by veteran West End director, Stephen Daldry (Billy Elliot, The Audience) who will aim to go above and beyond the productions original success. Billy Nighy has featured in major blockbusters such as Pirates of the Caribbean and Love Actually, Carey Mulligan recently starred in The Great Gatsby and Matthew Beard starred alongside Anne Hathaway in One Day. With such a star studded line up of actors the show is set to be a sure fire success. This show is a play about sexual relationships and adultery and is therefore not aimed at children.